Apologies for my absence lately. It's been pretty busy at work the past week (just wrapped a big photo shoot yesterday, whew!) and now my body is paying for it, i.e. I'm sick. In efforts to feel better, I thought I would post an old outfit from a couple weekends ago that I never got the chance to photograph. Now of course, I'm going to lie back down and feel sorry for my sick self. Happy Friday everyone! WOW! i love how this suit you. Amazing combination. Love the wide pants and the suspenders. Love your trousers! And I hope you feel better! Oh!! Sooo cute!!! Love the pants!! The combination of the wide leg pants, suspenders, and stripes are AMAZING. I love it. Hope you get better! I think I might be sick again too... ugh. Aww, sorry to hear you're sick. Get well soon! this is seriously making me want a pair of wide leg trousers. those look so good on you. and i love it paired with suspenders and a stripey shirt. nice! i love the suspenders...so vintage! i never know how to pull off a nice look with baggy pants but this outfit is superb! Ugh I love that necklace but you didn't tell us where its from! Get some rest and get better. Sick is no fun. trousers & suspenders, love them! and try to get someone to make you homemade chicken soup and get some emergencee (vitamin c packets)...hope you feel better. xo. Love this outfit!!! Those pants make your legs look miles long! Love the blog! Those jeans are so insanely perfect. You look amazing!!! 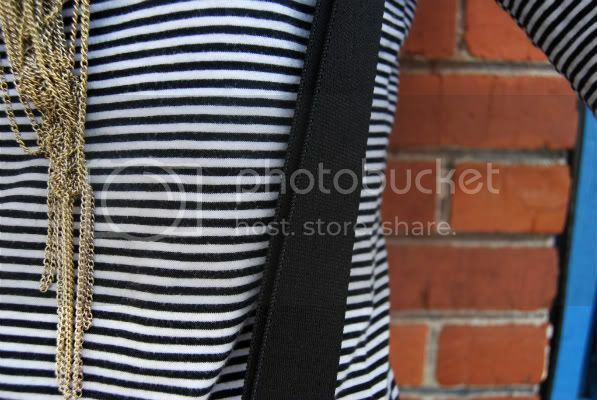 Wide leg denim look so great with suspenders.. Stripes are classic and always stylish! I really love that hat- you wear it so well. Such a great look. I am having some serious lust issues with your pants! Yay suspenders! I love the wide leg silhouette on you.